Headquartered in Austin, TX Freescale is reportedly one of the world’s leading semiconductor manufacturers. According to recent reports, the US company has released a new high-performance i.MX 6 central processing unit that sports four ARM Cortex A9-based cores. Apart from the quad-core chip, Freescale has also revealed the single-core i.MX 6 Solo and the i.MX 6 Dual that apparently packs two ARM cores. 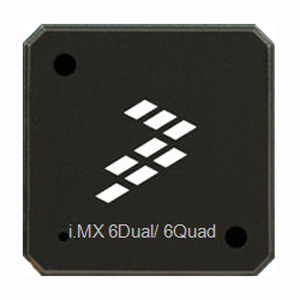 The i.MX 6 Quad family reportedly delivers “unbounded consumer experience” and is capable of processing dual-stream H.264 1080p video content (3D class video decoding). In addition, the company’s graphics architecture supposedly offers 3D rendering with 200MT/s, separate 2D BLT and OpenVG engines for enhanced UI performance and vector-based graphics. Further features include support for DDR3 RAM, SATA interface, PCIe connectivity, Android, Linux and Windows OS. Unfortunately, Freescale has not yet disclosed pricing details.